This is a fine release from The Grand Astoria which demonstrates why they’ve built up a fervent cult following, now I’ve experienced their progressive madness I will be paying keen attention in future. I can’t believe it has taken this long for me to cross paths with The Grand Astoria. “The Mighty Few” is the sixth full length by this Saint Petersburg band led by guitarist, vocalist and musical mastermind Kamille Sharapodinov and it makes quite an impact. “Band” is a bit of an understatement though as the two monstrous 20+ minute tracks on offer here are performed by nine musicians with suitably grandiose results. First up is “Curse of the Ninth”, a sprawling 28 minute odyssey exploring the classical music superstition that a composer is fated to death before completing a tenth symphony. 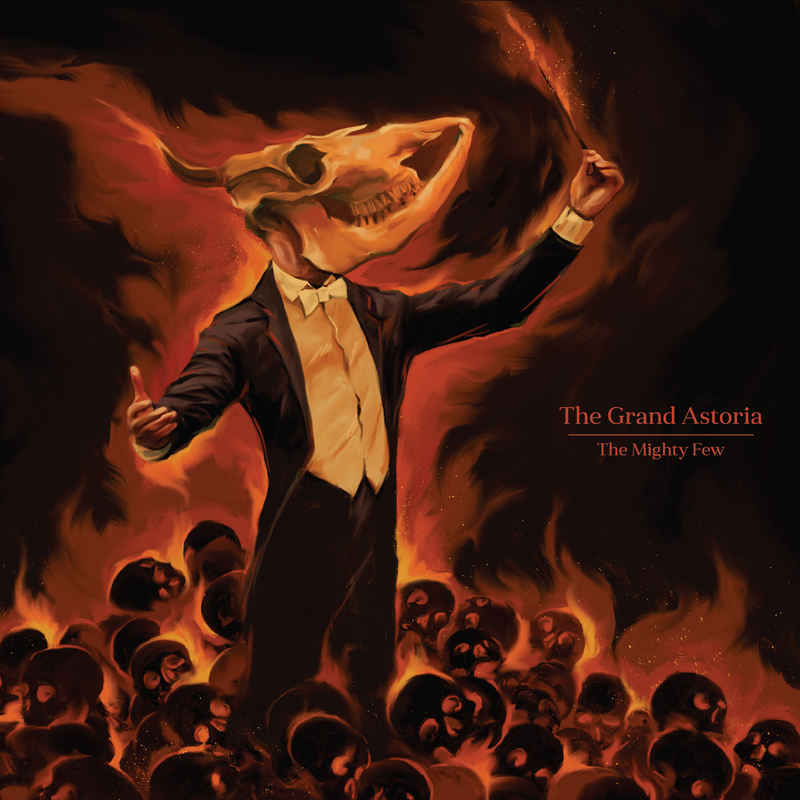 I’m not sure where The Grand Astoria is up to in terms of symphonies but this track alone displays enough restless energy and ideas to suggest they are invulnerable to this prophecy. Opening with a subdued jazzy jam, the track erupts into slow, heavy riffage reminiscent of Mastodon at their most anthemic. Progress takes a number of unexpected twists and turns from here; folky acoustic passages, Queen-style acapella harmonies and most notably a groovy mid-point freak-out that brings to mind disco-prog weirdos Chrome Hoof. The jazzy motifs and powerful riffs weave in and out of these stylistic excursions, becoming stronger and more powerful as the song draws to its conclusion. Kamille’s ultra-melodic vocals make their presence felt at regular intervals to elevate the music to operatic levels of bombast. I’m not normally a fan of this vocal style and would generally prefer something grittier and harsher but they really work in the technicolour absurdity of The Grand Astoria’s music. The second piece on offer here is “The Siege”. Opening with a keyboard laden prog gallop in the vein of ELP, this song covers a similarly mind boggling number of genres as “Curse of the Ninth” but has an overall darker feel. Following some bass solo-heavy funky jams, an ominous one-chord military riff rears its head. It builds in intensity through the song, weaving in and out of King Crimson bursts of dissonance, before blossoming into an unexpectedly uplifting final chorus complete with a blazing guitar solo and epic brass arrangement.